On a recent November evening I joined twenty other curious folks at the visitors center at the Fernald Preserve near the Great Miami River in northwestern Hamilton County, well north of downtown Cincinnati, Ohio. Skies are clear with no moon and plenty of stars. It’s about 40 degrees Fahrenheit, and I’m bundled up in layers of my favorite cold weather clothes. It’s a perfect night for owling. As we hike along a gravel path our guide, the Fernald staff naturalist, sets a brisk pace to keep us warm. We tramp along for about a mile and cross a boggy spot caused by beaver activity. Then we arrive at our destination, a temporary canopy set up as if for a tailgating party. But this is not a sporting event, this is science. We crowd under the canopy and step carefully into the light of three lamps clamped above us. We lean forward to look at the array of scientific measuring tools spread out on two tables. Somewhere, out in a likely spot of habitat, mist nets the researcher and his assistant set up earlier in the day wait in the darkness. Under the canopy we listen intently as the licensed bird bander, a scientist visiting from Indiana, tells us about what he hopes to accomplish tonight. We look at diagrams of the areas where fat deposits can be felt beneath the skin of living birds, and hear about bird weights in grams and measurements in millimeters. Wearing headlamps, the bander and his assistant walk out into the darkness towards the nets, leaving us behind. As the minutes pass we wonder what they will find. Last year the nets remained empty every night they tried to find owls, with not a single bird captured. After a long interval they return. They place a small red mesh bag on the table and the bander reaches inside to withdraw something feathered. “Too cute” is not a scientific description. But it’s all I can think about. I am totally enchanted by the little bird’s enormous eyes set deep amid twin circles of white and brown feathers. I stare at the feathers of its round head atop a compactly stocky little body, the wings at rest for now, and down to the legs and feet covered with soft, tiny feathers, so smooth, so small that they resemble furry kitten paws—it all adds up to a bird of stunning beauty, the very definition of cute. So appealing, so marvelous. All of us smile and smile. But this bird is not a pet, not a toy, and I will not be allowed to touch it. None of us may touch it. We can look, but that is all. This is a living creature of the wild, a small but fierce hunter that preys on mice and voles and shrews, sometimes insects, and that must be treated with respect. We cheerfully include admiration and delight. From a distance of only about three feet, I smile again and again as I gaze directly at the first Northern Saw-whet Owl (Aegolius acadicus) I have ever seen. I am eye to eye with a bird that weighs scarcely more than a handful of quarters would measure on the scale sitting on the table. Yet under all those pretty feathers are tendons and muscles capable of sustained flight over hundreds of miles—and all of them are attached to delicate little bones. The licensed bird-bander handles the bird with extreme care. No sudden movements, no unnecessary actions, only the gentlest, kindest, simplest contact to do what’s needed to gather a set of scientific data, all done according to standardized protocols and methods. Then the bird will be returned to the edge of the woods and released to fly free again. The first thing to do is to apply the numbered band to the bird’s right leg. Using a special tool, the bander crimps the metal and turns it carefully to make certain that none of those tiny feathers are caught by the band. The assistant writes down the unique number, and begins noting all the other numbers the bander calls out carefully as he begins a series of measurements. Number follows number: bill length, body weight, wing length in a natural curve, wing length with the feathers gently pressed flat. 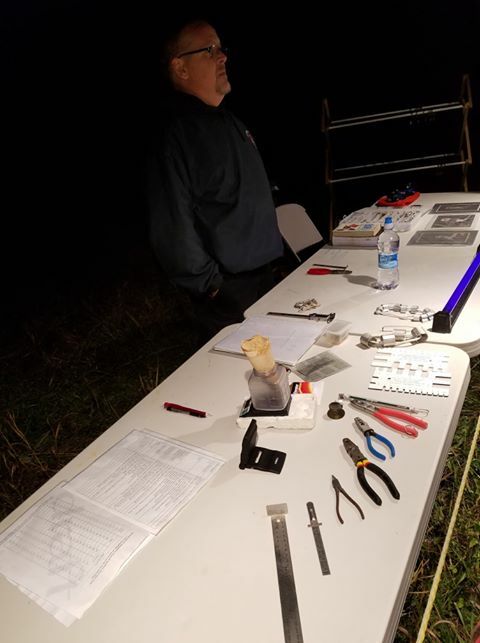 This flat measurement will allow tonight’s living bird data to be compared to preserved museum specimens from decades ago. One of the puzzles scientists hope to solve involves figuring out who’s a female, who is a male. Although the owls can tell easily, there are not yet any reliable, quick ways for human observers to differentiate the sexes. Some combination of measurements and perhaps feather color patterns may eventually reveal the key. For now, individual birds must be weighed and size comparisons made with known birds’ genders. Tonight’s subject of study seems to be a female. In this species, as in many owl species, the female is larger than the male, a characteristic known as reverse sexual dimorphism. Throughout the handling and measuring she is relaxed and does not struggle. She does not clack her bill or do anything except stare calmly right back at us as we stare at her. The researcher performs each task quickly, and uses the time in-between each maneuver to explain more carefully what he is doing and why. The Northern Saw-whet Owl is a bird whose seasonal movements are only now beginning to be understood accurately. Banding stations like this one are filling in the gaps of knowledge, slowly and steadily. 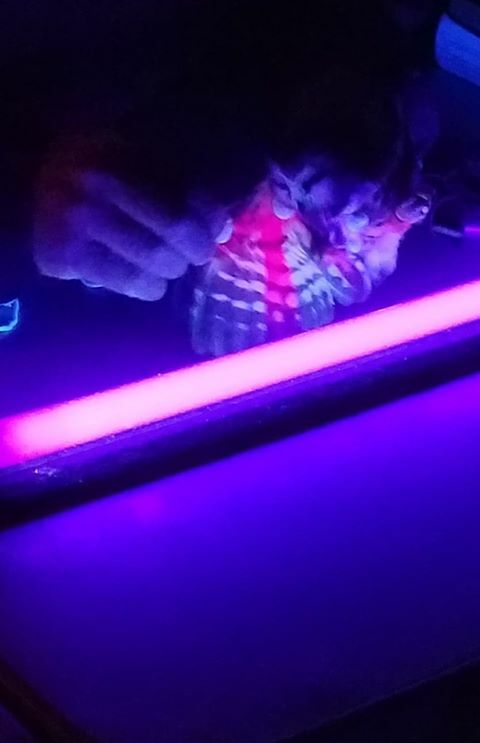 With the overhead lights turned off, the bander extends one of the bird’s brown and white wings then holds the underside toward a black light mounted on the table. The ultraviolet light reveals a new contrast. The feathers that now gleam pink are the newest feathers, and help determine an age range for the bird. Many years ago, naturalists thought this species was a rare winter migrant from the boreal forest to the north that didn’t often venture far south into the states below the Great Lakes. Banding studies and their data tell a different and more complex story. Starting in late October, some Saw-whets fly south toward the Ohio River Valley into Illinois, Indiana, southern Ohio and elsewhere. Some stay, but some continue to Kentucky or Tennessee, and a few go all the way to Georgia, Alabama, even Florida. The trends emerging from cold nights like this one are revealing a pattern common to several other bird species. Mature males and females may stay close to the breeding range, while younger birds of both sexes move south. Or it could be a combination that changes from year to year. Tonight’s banding data will be correlated with data collected elsewhere and studied by scientists for more clues. It’s a long, slow, on-going effort, with lots of number crunching. Cuteness is not a factor in these studies. But as the researchers work through the numbers I’ll bet they smile. 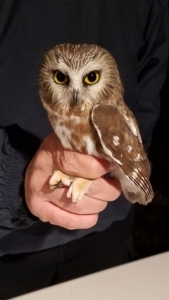 During the daytime you might be able to discover a perched Northern Saw-whet Owl if you look carefully into tangles of vines near pines and cedars in lowland areas, perhaps at the edges of old fields where mice and other small rodents roam. These birds are very naive around humans and seldom fly away when approached. But you must still take extreme care not to startle them or interfere with their lives. Do not use flash photography. Do not publish precise locations on social media. 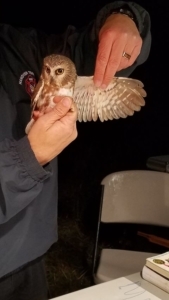 To learn more about banding studies and other research, and report any birds you find, visit the Project Owlnet website at http://www.projectowlnet.org/ for further information and updates.